I think I’ve ruined my puppets. I tried to make the eyes more realistic by building up layers of paint, from dark to light, but it didn’t work and I ended up painting over them in a solid colour. Now the eyes look big and sort of Disney character-ish; the Disney look is helped by the woman having long red hair. I might paint pupils in the middle. This entry was posted in sound and vision and tagged painting eyes, puppet making, sound and vision by Julia Fry. Bookmark the permalink. my sister hated that my puppets didn’t have pupils.. i like it. 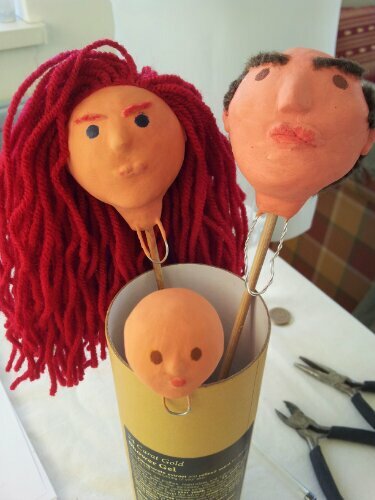 puppets are a species in their own right, a facsimile of reality but hang about they are made of clay for lordy’s sake.. they are adorable julia and look like a family! looking forward to if you teach them a thing or two through their eyes! It’s true – they are a different species. I was thinking, as I was trying to make their eyes realistic, that perhaps they need not to be realistic. Also, on my way home from the shop I looked at the graffiti painting of a green man – his eyes have an almond shaped outline and a black circle in the middle with a white background. Our brains fill in the rest. Simple, less is more, works, I think. Thanks, Jus, for your comment. Your puppet is beautiful – emerald green eyes without pupils.